After the great success of the Pendrell Blouse, the first pattern from Sewaholic, we are now really excited to have in stock the second pattern, the new Crescent Skirt. The Crescent skirt is a great gathered skirt with a fitted yoke. Your choice of a slightly gathered skirt, a fuller gathered skirt or a longer, knee-length skirt. Optional trim or contrast topstitching highlights the fitted waistband. Or, keep it simple with the seamline details only. A great addition to your wardrobe. Apart from the fact that this skirt is awesome, do you know the most exciting thing? 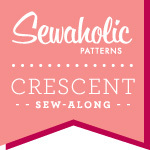 Tasia is running a sew-along on her blog for the Crescent skirt to help you through the pattern. And most valuably, help and instruction from Tasia herself. Oh, and it has pockets... yes, pockets... perfect. Stop Press! Lisette Patterns in stock! Very exciting news... we have recieved a one-time-only delivery of Lisette Patterns. These are the Simplicity patterns designed by the clever folks at Oliver+S. We have limited availabilty of these patterns, and once they are gone, they're gone!